Dating as far back as the 17th century, Schloss Kleßheim Palace was used by Adolf Hitler during World War II and today serves as a casino with an elegant atmosphere and beautiful gardens. The palace also featured in the 1965 film The Great Race starring Jack Lemmon, Tony Curtis, and Peter Falk. 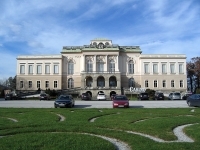 The casino holds some historical interest because of the association with Hitler during the war, and the eagles displayed at the palace entrance are reminiscent of the Third Reich. However, the main appeal is the chance to gamble and party the night away in style!